Half of the $1.4 million prize went to Charles K. Kao for insights in the mid-1960s about how to get light to travel long distances through glass strands, leading to a revolution in fiber optic cables. The other half of the prize was shared by two researchers at Bell Labs, Willard S. Boyle and George E. Smith, for inventing the semiconductor sensor known as a charge-coupled device, or CCD for short. CCDs now fill digital cameras by the millions. Without CCDs to take the pictures and fiber optics to carry them from my house to the server that broadcasts them to the world, there would be no Friday Catblogging. So congratulations to Drs. Kao, Boyle, and Smith. The catbloggers of the world salute you. 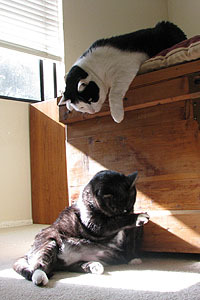 The cats of the world would salute you too if their appreciation of light went beyond coveting sunny patches on the floor.